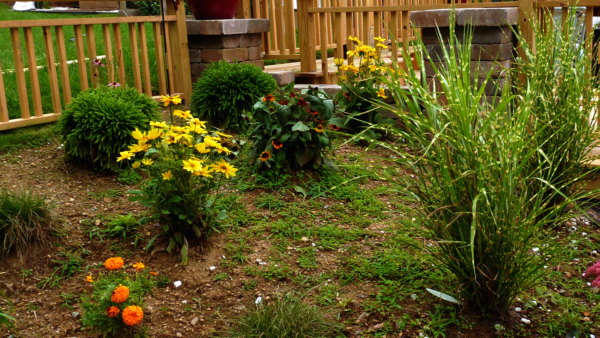 After we finished our new little garden we quickly realized that it wasn’t going to stay looking footloose and weed free for very long. Within a matter of weeks it quickly went downhill from looking like this all neat and tidy with freshly raked dirt and our cute new plants. To this hot mess full of crab grass and other unnameable things with roots reaching so deep you envision someone in China pulling on the very same weed. We were losing the weed battle, definitely not the look we were going for. We knew it was about time to get our mulch on. I’ve always loved mulch since I was a kid…yeah I’m weird like that. I also loved watching This Old House with my Dad on Saturday afternoons when I was little, go figure. 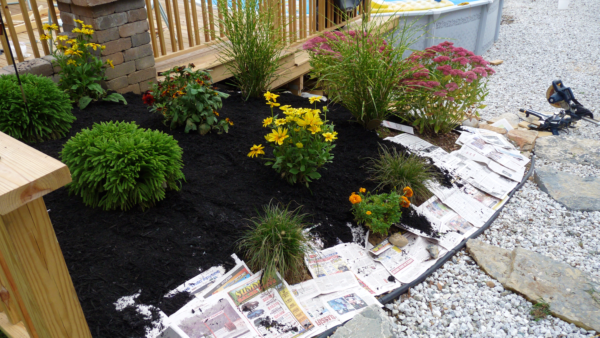 We went off to Home Depot and got a bunch of bags of black mulch, and gathered newspapers from the recycling pile. A long time ago we read somewhere that newspapers make a fantastic weed barrier instead of the usual black plastic. 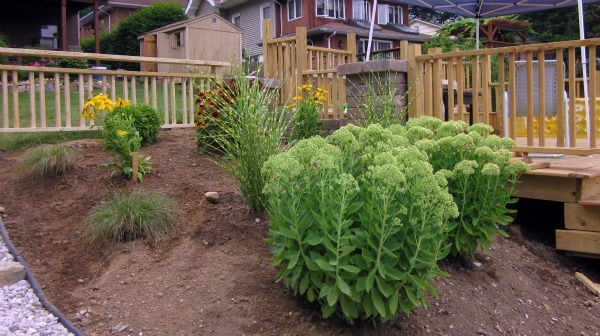 We’ve used it as our go-to weed barrier in planting beds for years. It withholds light stopping the weeds from growing while allowing moisture to penetrate to the soil. 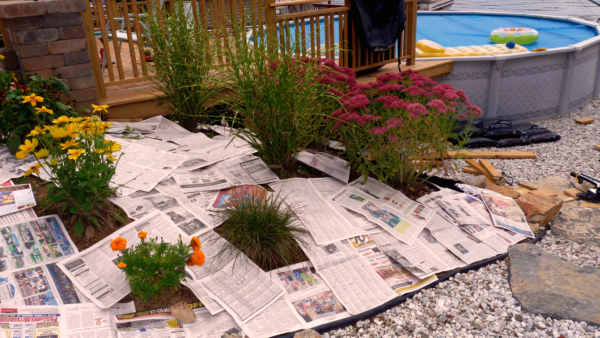 The newspaper holds up surprisingly well with mulch on top which is also a natural weed barrier giving you an added layer of protection in garden beds while being completely biodegradable and the best part is it’s absolutely free since we just save a bunch of Sunday newspapers as we go and use them when we’re about to mulch the gardens. I basically worked my way around the garden laying out the newspaper 2 to 3 sheets thick overlapping the edges to ensure full coverage, luckily this day it wasn’t windy so there was no running around like a crazy person holding the edges of the paper down. A smarter person on a windy day may want to dampen the newspaper slightly to keep it from flying about. But that’s just if you’re smarter than I am. Once the newspaper weed barrier was in place we began spreading the mulch in around the garden in sections about 1 1/2 to 2 inches deep. Making sure to wear gloves since the dye used in black mulch tends to rub off of the mulch but sticks to your hands permanently, so unless you’re going for the black dye covered hands look gloves are probably your best option. After a quick couple hours the garden was in tip top shape again. We’re really happy with how this little project turned out. I’m really liking how neat and tidy it all looks again and how much more vibrant to colors of the flowers are against the black background of the mulch. We’re totally please with house this turned out and it was super cheap too. 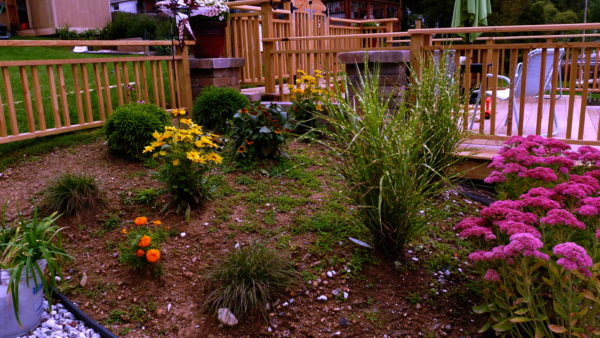 The mulch was around $3.50 a bag and we used about 6 bags for this little garden. The newspaper was free since we saved it from the recycling bin. So we brought about this dramatic change and time saving weed control not too mention our plants love the added moisture for around a whopping $21.00. It looks really, really great. Hi? I found your blog from your bedroom makeover posted today. I have a question about this? 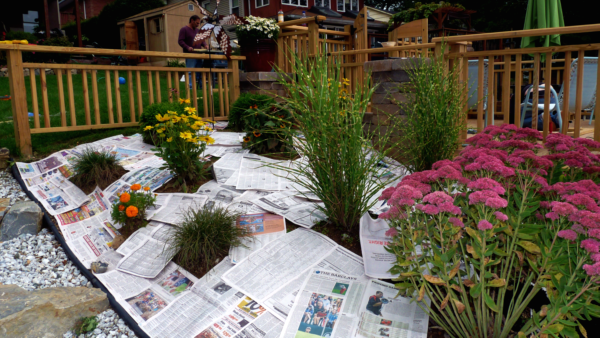 Does the rain move the mulch and expose the newspaper? 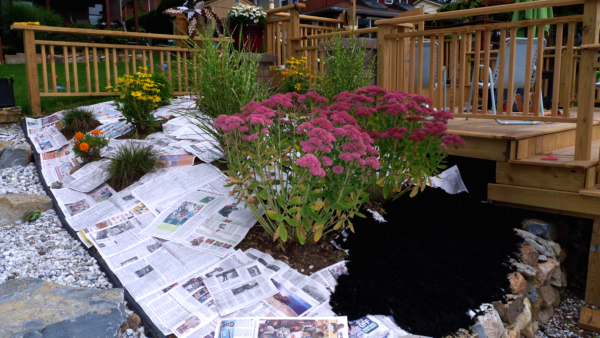 I have though about doing a newspaper barrier between my mulch and dirt, but the rain always moves my mulch around so I wondered how it worked long term? Hi Janet, Thanks for stopping by. We’ve been using the newspaper for years and it works great as a weed barrier but it does decompose over time. It actually moves around less than if you had that plastic weed barrier underneath. Usually when we’re done we mist it with water and it seems to mesh the whole thing together nicely and stops it from shifting around too much. Actually,come to think of it we had a hurricane since putting it down and it hasn’t moved at all. Hmmmmmmm thanks for sharing this great ideas. 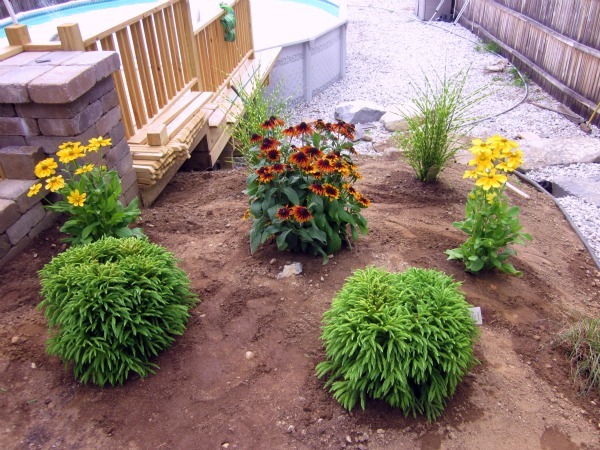 I have a ton of landscaping to do this spring and this could come in handy! btw- you bed turned out great! Thanks again Dee Dee. I love to decorate outside in the yard as much as inside. I can’t wait for Spring to come to get back out there. Thank you for this…I am fixing to do this in my front yard. 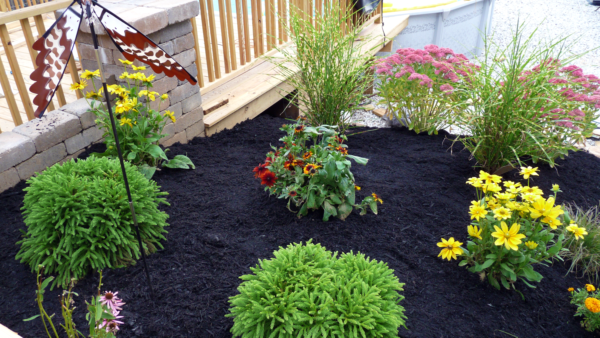 I love the look of the black mulch and I love that you are using a bio degradable substance. I have two questions. 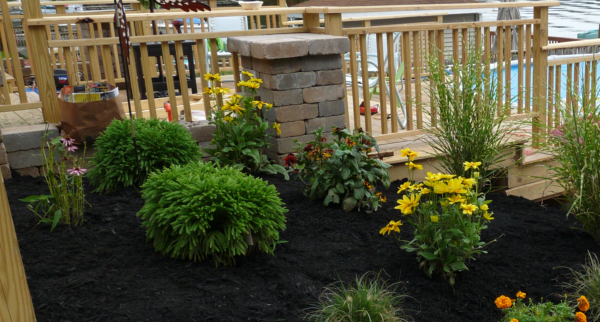 How has your black mulch held up re: holding its color? And, what are those two cute round plants? I love them think you! BRILLIANT IDEA AND MANY THANKS FOR SHARING IT. 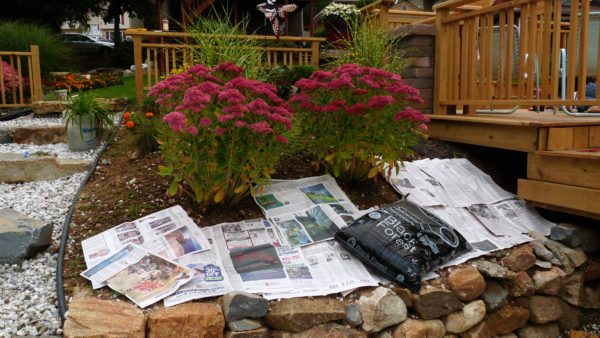 JUST ONE QUESTION…HOW LONG DOES IT WORK FOR AND WEED START COMING AGAIN also would sand get blown away and deposit on mulch helping new weed to come on top of the news paper?